The Big Society’s greatest strength is that no-one actually knows what it is, possibly not even the Prime Minister whose stroke of genius was to create a concept so vague, but so obviously ‘good’, that almost anyone can support it. Whether you want a small state, government involved in every aspect of community and social life or something in between you can find some- thing in the Big Society that will fill your needs. Trying to divine what the government actually means by Big Society has become a small industry. Taking David Cameron’s speech in Liverpool as a starting point he outlined three strands, social action, public service reform and community empowerment and peppered his speech with words like philanthropy, innovation and ‘voluntarism’. But these are hardly new concepts, most have appeared in various government fads that have come and gone over the years (I was struck by how much the themes of public service reform and innovation resonated with the early 90s vogue for Osborne and Gaebler’s ‘Reinventing Government’). Indeed, David Cameron might view the philanthropic founding of Eton College several hundred years ago as nothing more than a proto-Big Society free school! What is new is the need for central government to dramatically reduce public spending at a time when government – for good or bad – impinges on more aspects of people’s lives than ever before. It’s tempting to take the cynical view that it’s a smoke screen policy to offer warm and fuzzy feelings the Treasury can no longer afford. Yet that would be overly simplistic and fail to reflect the reality. Big Society is the mantra of all politicians in government. Every department has a Big Society minister, every announcement a Big Society reference. UK government websites already contain over 13,000 Big Society references and the total grows daily. Across the country voluntary organisations and community groups are starting to think about the opportunities the policy gives them. Slowly and surely a Big Society is being built, even though no-one quite understands the architect’s drawings and vision. If there is a common understanding it’s that local councils are not a part of the Big Society. 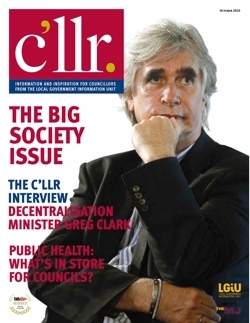 While there may not be any diktat stating that local authorities can’t join the Big Society gang, the language rarely mentions them. In the Prime Minister’s announcement he may have named four councils as early pilots, but then went on to address the people of those boroughs and challenged them – not their councils or councillors – to identify the blockages they needed removed to build the Big Society. And it almost seems that councils have rolled over and let this happen. Two months after the Prime Minister’s launch of the four pilot areas only Windsor and Maidenhead had published anything other than press releases related to the Big Society and how they were helping to make it work. Liverpool had not even published a press release, despite being host to the launch. It is almost as if, after decades of centralisation and Whitehall direction, Town Halls are unable to take on the opportunity without being told. The irony is that while this is the biggest chance in a generation for councils to exercise freedom in shaping their areas, it might also be their only chance for another generation. The government’s approach to local government seems to have been populism rather than localism; should a localist minister really be telling Newham if it needs a chief executive, or Leicester its councillors’ IT needs? If the vague nature of the Big Society is its greatest strength, it can also be a great opportunity for local government. The choice is simple, either stand back and watch the Big Society being built around us, or join in with the building and help our communities improve our neighbourhoods; and isn’t that the reason most of us got into local government?